In part one of Good Morning, Kimchi, readers are taken on an odyssey through the pickled vegetable's theory and history, the science of the dish, along with its many different tastes, the ingredients and utensils needed to make it, and the customs associated with kimchi itself. In part two, facts concerning the reality of making kimchi are introduced before 20 types of traditional kimchi, all using Korean ingredients, are explained, and then 20 different types of fusion kimchi that blend ingredients from around the world with this distinctly Korean staple. Chapters on History, Science, Preparation, Storage, Ingredients etc. Traditional Kimchi recipes, such as: Cabbage Kimchi, White Kimchi, Wrapped Kimchi, Soy Souce Kimchi, Radish Kimchi, Oyster Kimchi, Cucumber Kimchi, Ginsaeng Kimchi, Watery Kimchi and many more! Modern Kimchi recipes with eggplant, carrot, turnip, green bean, broccoli, asparagus, cauliflower and many others! 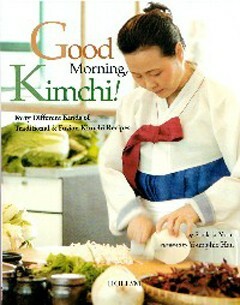 Weiterführende Links zu "Good Morning, Kimchi!" Unser Kommentar zu "Good Morning, Kimchi!" Kundenbewertungen für "Good Morning, Kimchi!"